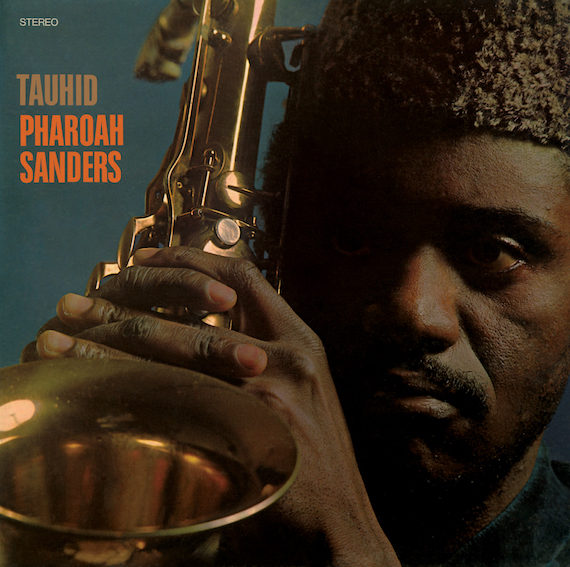 When Pharoah Sanders entered the studio to record Tauhid, his second album, he must have felt at ease. Which may have come to a surprise to him. Though he’d developed a reputation as an intense tenor with an idiosyncratic style, Sanders had yet to establish himself as a marquee player. Pharoah’s First had come and gone in 1964 without making much of a splash; while the soloing is marked by the intense overblowing that was already becoming his trademark, it overwhelms the hard-bop backing of the band, even one working as hard as this one. But by the time he assembled a group to record the follow-up two years later, he’d ridden the hoarse wave of his sound far enough to become one of jazz’s most exciting young players. He was playing regularly with John Coltrane, whose sound Sanders was helping to redefine on records like Ascension and Om, and with whom he’d toured Japan. He’d recorded with Ornette Coleman and worked with Sun Ra, who gave the man born Farrell Sanders his regal nickname. Tauhid–which along with 1969’s Jewels of Thought and 1970’s Deaf Dumb Blind (Summun Bukmun Umyun) is now being lovingly reissued by Anthology Recordings–came at a watershed moment. It would be his first for the powerhouse Impulse! Label, and and his first chance to step out from his enviable role as Coltrane’s confidant and establish himself as a true member of the vanguard. So it’s still surprising today, fifty-one years after the album’s release, just how long he waits to make his voice heard. It takes a full five and a half minutes of “Upper Egypt and Lower Egypt,” the album’s two-part opening track, before the leader appears–and when he does, he’s tooting a piccolo. It’s an inauspicious greeting, but a deft one, too: While we’ve waited for the soloist to take to the stage, his band, led by Dave Burrell’s chunky piano chording and the rumble of Roger Blank’s toms, gin up a distant thunderstorm and slowly bring it nearer. As they recede and Sanders enters, it’s as though he’s descended from a dust cloud, a mythical man humming through a pan pipe. He finally picks up his horn a good seven minutes later, and again he takes his time, slowly moving from warm notes of gratitude to the kind of all-out reed-biting attack for which he’s still most well known. “Japan,” a traditional tune Sanders learned on tour in Asia, follows in a kind of gummy gray mode that has nearly as much in common with the bedroom lo-fi of, say, mid-’90s K Records and the sweated-out folk of Amen Dunes as it does with, say, Coltrane’s Live in Japan. Tauhid, then, is a strange record–it’s formally sophisticated and shows flashes of the brilliance that would bloom three years later on the instant classic Karma, but it lacks that record’s sense of locomotion and thematic unity. And, perhaps more importantly, it lacks Lonnie Liston Smith. The Virginia-born pianist would join Sanders on 1969’s Izipho Zam (My Gifts) and would remain by his side through 1971’s Thembi. Smith’s playing is bright, easy, lyrical, and, perhaps most importantly given the level of questing going on around it, familiar. On Jewels of Thought’s “Hum-Allah-Hum-Allah-Hum-Allah,” he gives Sanders a spruced-up base from which to launch, but Sanders seems just as happy to follow his pianist. The two play around one another cheerfully, each occasionally departing to take a solo trip through the sky before returning to the ground. Around them, the song develops with the same natural grace. Even as Sanders trills and Roy Haynes and Idris Muhammad count out counter-rhythms, a feeling of mutual wonder permeates the playing. “With peace we can move ahead together,” vocalist Leon Thomas says near the song’s beginning, and later he offers up a simple supplication: “Prince of Peace, won’t you hear our pleas / And ring your bells of peace / Let loving never cease.” For the moment, it seems like a foregone conclusion. In 1970’s Deaf Dumb Blind (Summun Bukmun Umyun), the reverence that perfumes “Hum-Allah-Hum-Allah-Hum-Allah” becomes elemental. The title is a quranic phrase that refers to the eventual enlightenment of the unbelievers, and Sanders treats it like a gracious promise. The ostinato sway of Cecil McBee’s bass and a glossolalia of percussion instruments lead the way. Smith hammers out hard chords, while Woody Shaw blats out a trumpet line worthy of a New Orleans street parade. The entire band swings together in a kind of march, in fact, harbingers of the sweet relief of universal knowledge and the abolition of confusion; they play as if their joyful blowing is lighting up the edges of the darkness. But the high point of the set–and quite possibly Sanders’ career–is its B-side, “Let Us Go Into the House of the Lord.” If “Summun Bukmun Umyun” is the processional toward history’s happy end, Smith’s arrangement of the traditional spiritual is the space-hung world beyond. For nearly eighteen minutes, the octet vamp together on a soft drone. Each member occasionally steps out from behind the curtain of shakers and bells to take a sweet solo, then recedes back into the ensemble’s embrace. Sanders executes a series of graceful flips, flirting with the border of tonality before gliding into a warm, shimmering tone that’s matched by the vibrato bowing of McBee’s bass. Smith decorates the edges, throwing out flickering runs from his right hand while his left boils the rhythm. They all drift like this together, going nowhere in particular, full of activity but not consumed by it, agents of a beauty so natural that its sophistication and complexity only begins to unfold after a half-dozen close listens. Pingback: Pharoah Sanders: Tauhid / Jewels of Thought / Deaf Dumb Blind (Summun Bukmun Umyun) • tuneboxes. Just listened to Tauhid on Apple Music. Amazing album. Thanks for bring all this cool music to my/our attention.